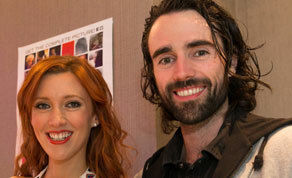 Amy-Joyce Hastings and Seán T. O Meallaigh to attend the screening. Dublin director Graham Cantell’s romantic comedy ‘The Callback Queen’ - about an actress struggling to resist her director’s advances - will have its world premiere at the Galway Film Fleadh on 10th July. The film is Mr Cantwell’s second feature after ‘Anton’, set in Northern Ireland during the Troubles, which was released theatrically and nominated for three IFTA awards in 2009. Set in the London film industry, ‘The Callback Queen’ stars Irish actress Amy-Joyce Hastings (‘The Tudors’) and Mark Killeen ‘(Game of Thrones’) in the leads, who will also be present at the screening. Other cast members include Seán T. O Meallaigh (‘Kings’); Kate Braithwaite (‘Little Deaths’); Morgan Deare (‘United 93’); Eoin Macken (‘Merlin’) and Vicki Michelle ('Allo, Allo’). The film follows a young actress chasing her big break who must maintain her integrity in the face of her director's romantic attentions. Also in attendance at the screening will be Mr Cantwell, Executive Producers Martin Carroll and Stephen Gibson (RCA Media) and Emmy-nominated composer Joseph Conlan who scored the film. Mr Cantwell previously won the Kodak Tiernan McBride award at the Galway Film Fleadh for his short film ‘A Dublin Story’ which was subsequently shortlisted for an Oscar nomination in 2004. 'The Callback Queen' will have its world premiere at the Town Hall theatre at 7pm on Wednesday 10th July. Tickets for the screening can be found by clicking here.